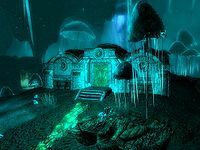 Sinderion's Field Laboratory is Sinderion's alchemical foothold in Blackreach. The laboratory can be found very close to the entrance to Blackreach from Alftand. After going down the steps from the entrance, the Dwarven building can be seen ahead and to your left. Sinderion's remains can be found in the room, still clutching his field journal, his body riddled with dwarven arrows. This is where Sinderion eventually found himself after having been shown a sample of crimson nirnroot by a passing adventurer during his time in Skingrad, as his journal reveals. Reading the journal (or collecting crimson nirnroot from the plant in the room) will trigger a quest to finish Sinderion's research. Sinderion had set up a full alchemy station, including an alchemy lab, a rare-type apothecary's satchel, a copy of the Alchemy skill book De Rerum Dirennis, and thirty different ingredients which are listed in the table below. Other items of particular interest are a pair of Leather Boots of Hauling and an attunement sphere. There is also a knapsack, two chests, a dwarven dagger, and three soul gems (1 filled lesser soul gem, 1 greater soul gem, and 1 random soul gem), in addition to a typical range of Dwemer household items and scrap metal. A Return To Your Roots: Go where a famous alchemist could not in order to aid ground-breaking research. Taking the attunement sphere from this lab may render it permanently stuck in your inventory if the quest Discerning the Transmundane has been started. This issue has been addressed by version 1.0 of the Unofficial Skyrim Patch; once that quest line is complete, all related items can be discarded normally. If you have Serana as a follower, after leaving the laboratory she will not follow you anymore and just stand in front of the laboratory. Waiting or speaking to her will not help, but if you use one of the lifts she will be teleported back to you and follow you as normal. Use moveto player from a few steps away from the lab's door. This page was last modified on 22 November 2018, at 03:53.